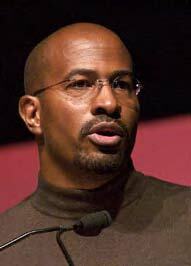 AAEA Hollywood: Van Jones on "Real Time with Bill Maher"
Former Obama administration Green Czar Van Jones appears on "Real Time with Bill Maher" on HBO on Friday, June 4, 2010. Maher has been quoting Jones saying he was right to call Republicans "assholes" and reprimanding President Obama for allowing Jones to resign due to coverage by Glenn Beck. Well whom do you identify with: Maher or Beck? Maher is liberal and hates God, kids and marriage. Beck is a conservative and loves God, kids and marriage. Okay. So that's a short list. Regardless, it should be a good show. Although Van said he 'loves' Glenn Beck, I don't believe him. Just know that Beck will be watching Maher's show and will surely utilize statements made on the show against Jones. And I bet that President Obama just can't wait to be drawn back into this feud. Is Maher instigating?